Valentina is an inspiring teacher, and blends classical Hatha Yoga adapted for all levels with vinyasa yoga to make classes fun, challenging and inspiring. She connects with each and every student and her warm, open demeanor allow her to really see what each student needs. Having trained using ancient Indian methods learned in her various studies all over the world. Classes with Valentina improve agility, muscle tone, strength, flexibility and breath control. Valentina believes in yoga’s physical and mental benefits, providing a holistic harmony in our bodies through asanas and pranayama. This helps to promote a balance between the nervous system and endocrine system, then directly influencing all organs in the body, providing an improvement in overall health and wellbeing. 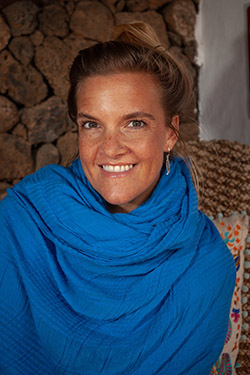 Valentina loves living and teaching yoga in Fuerteventura where she can surf, kitesurf and body board, and feel the benefits of her yoga practice through improved coordination and flexibility, and sees that yoga improves self confidence and helps us feel connected. She strongly believes in yoga as a way of life, which can only be learned through experience.